So my kids are still very much enjoying their Minecraft time – they get very little screen time generally and have to earn their Minecraft play time (I am so mean!! 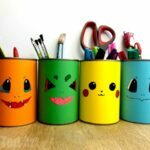 ), but it works for us, as it really focuses their time online… but I am digressing, I actually wanted to share our super duper easy make with you today – which includes some FREE Minecraft Desk TidyPrintables – these Tin Can desk tidies! 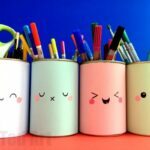 We have made a number of desk tidies over the years and the tin can ones proof to be our most used and most loved. They are practical and last forever! Once you have your desk organised, hop over to our Creeper Corner Bookmarks and get you reading organised too! We love DIY Corner Bookmarks! You can watch the easy peasy video how, or check BELOW the video for step by step written instructions! 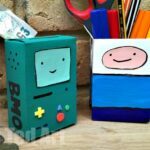 If you can’t view the video, here are some step by step written instructions for making your minecraft desk tidy!! 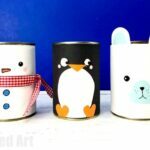 1) Wash your tin can and peel the labels. You don’t have to get ALL the label glue off.. so don’t worry if it is hard to remove! 3) Check if the printable fits your tin (it will fit most tins.. but MAY need a little trim for some). Trim if necessary. 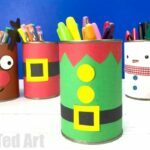 4) Add tape along one end of the printable and aline the tape with any glue residue on the tin. Stick firmly down. 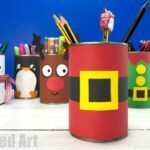 5) Now wrap the tin with paper – make sure it is flat and neatly alined. 6) Tape down the other end.. and you are finished. 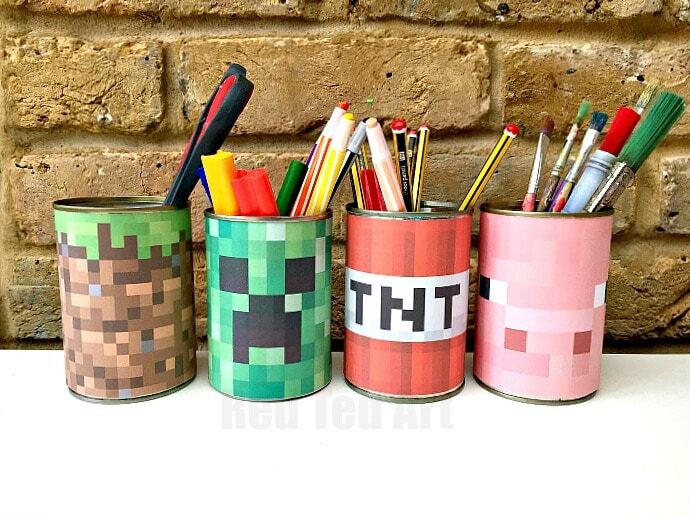 Yes, it really is that easy.. and takes only a couple of minutes per Minecraft desk tidy!!!! We have more minecraft crafts for you to browse, as well as some **amazing** Minecraft Cakes, if you need some minecraft party inspiration! Wow! what an idea! 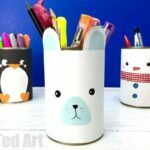 Such a pretty kids art desk tidy diy. I just loved it. Must say I need it for my baby. Thanks for sharing this cute thought. Wow! 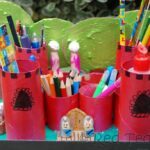 so pretty kids art desk. This amazing art desk must inspire kids artwork. It will grow kids creativity. I need this for my kids for increasing their creativity. I think kids should grow up physically as well as mental. An attractive art desk help to build kids mental growth. Thanks for sharing such a great idea for kids. It’s really helpful for kids. HI I am unable to pull up the printables from the link above…..help please!! Thank you! I have added a big red “printable” button for you to make it easier to locate! Click on that! this was very helpful thankyou ! !